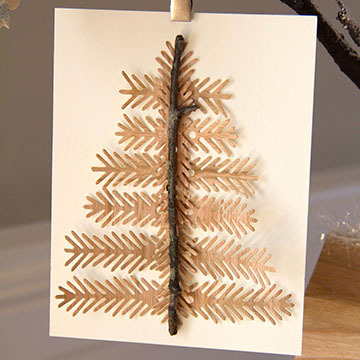 We love to make cherished holiday decor that we can display year after year. This Cherry Wood wreath was a little labor intensive, but creating it was a labor of love. 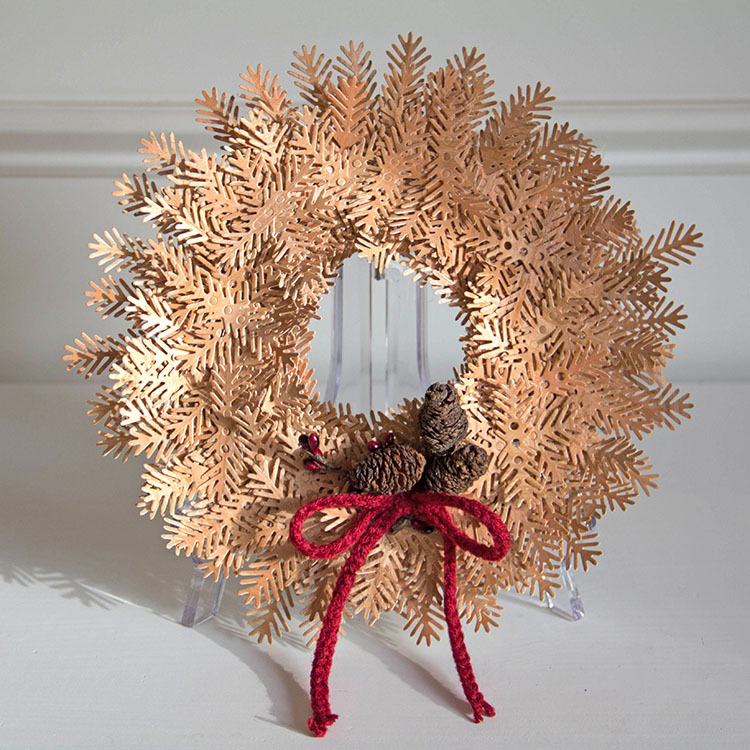 We created this wreath using Cherry Wood paper and the Take a Bough Die from Concord & 9th. 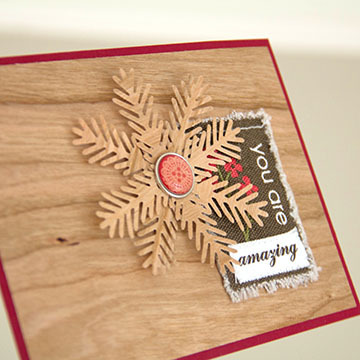 We had so many little boughs left over that we created a couple of fun cards. 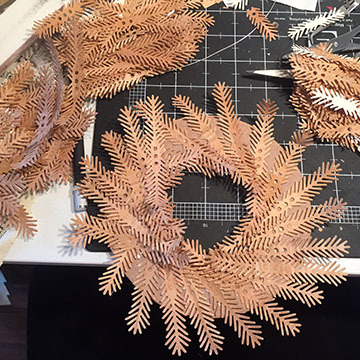 Below are tips on creating this wreath. 1. 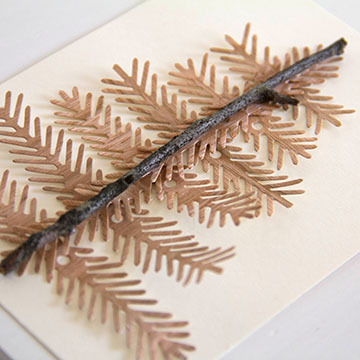 Die-cut 100 boughs in Cherry Wood paper in 3 various lengths using a manual die cutter and the Take a Bough dies. 2. 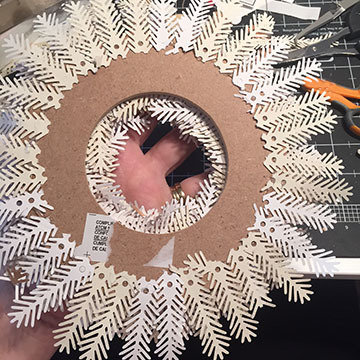 Hot glue boughs on cardboard wreath base starting with the largest boughs first. 3. Hot glue another ring of boughs using the medium bough. 4. Hot glue another ring of boughs using the smallest bough. 5. Fill in any holes or thin spots with additional boughs. 6. Hot glue 3 tiny pinecones in the bottom center of wreath. 7. 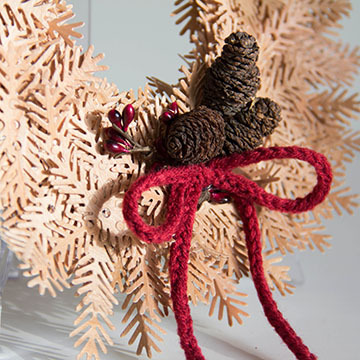 Tie red yarn bow and glue next to pinecones. This entry was posted in DIY Projects, Home Decor and tagged Card, cardmaking, Cherry Wood paper, Concord & 9th, Holiday Decor, wreath. Real Wood Ornaments for Christmas!